The Garden Academy > Micro-Homesteading > Urban Chickens – can chickens and the lawn get along? Urban Chickens – can chickens and the lawn get along? Can chickens and lawns get along? Yes, as long as both are managed organically. In fact, they can be mutually beneficial if we work it right. We just have to know the needs of each and meet them without sacrificing the needs of the other. Sounds complicated, but it’s not. Lawns need nutrition, water, sunshine, and proper leaf blade height. Chickens need all of those things, too. See, it’s already getting easier. Synthetic fertilizers should never be used where chickens will range. They contain chemicals that are harmful to the birds whether they are eaten or absorbed through contact. There are several choices in organic fertilizers; those comprised of all natural ingredients. They do not contain harmful chemicals. Their ingredients are found in nature, and work WITH nature. 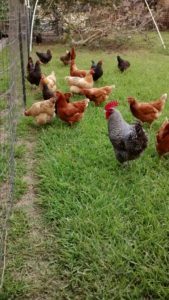 Chickens will not see them as a preferred food, but if they inadvertently pick up a few grains while they are grazing, no harm will come to them. You should look for products that are categorized as “slow release organic fertilizers” (SROFs). Some names to look for are MicroLife 6-2-4 or 8-4-6, Arbor Gate Organic Blend, Nature’s Guide 4-3-2, Lady Bug Naturals 8-2-4, and Soil Mender Turf Mate. Some SROFs contain poultry manure or feather meal. It is pasteurized during the manufacturing process so it will not introduce pathogens that threaten your flock. Another safe option is to use liquid organics such as Ocean Harvest or HastaGro 12-4-8. These water soluble products can be applied using a hose end sprayer set at the appropriate dilution rate. Liquids will soak into the soil and be absorbed by leaf blades where they are inaccessible to the chickens. Their ingredients pose no harm through absorption. Chickens will provide nutrition to the lawn when they deposit their manure. Chicken manure is normally considered a “hot” manure due to its high nitrogen content. Even though lawns appreciate more nitrogen than the majority of the garden, chicken manure would normally be composted before it is used in any large quantity. However, the wide and random distribution of droppings in your lawn will not burn or harm the turf. Chickens are omnivores. They will receive part of their nutrition from the lawn by consuming insects, worms, weeds, weed seeds, and by “clipping” the grass blades as they graze. All of this activity is beneficial to the lawn, reducing the frequency of mowing and the need for weed or insect control. Both the chickens and the lawn need water, but not at the same time, or the same way. Chickens should not be grazing on a lawn that is still wet from irrigation. Allow the lawn to mostly dry off before turning them out. Some breeds have feathers that repel water better than others, but a cold, wet chicken is a miserable chicken and is susceptible to illness. Yes, chickens will stay out in a light rain, but will seek shelter from a hard rain. For a chicken, irrigation is like a heavy rain – too much water, too fast. Chickens and lawns need sunshine to flourish, but chickens need shelter from too much sun during the heat of the day. Your flock will find a shady spot under a tree or shrub and rest there regularly when it gets too hot for them. If there is no natural or landscape feature that provides shade, you will need to provide it for them. Chickens will rest in this spot frequently enough to create a bare spot. Keep this in mind when locating the sun shelter in or near your lawn. Chickens like a grazing height of 3” – 5”. This is a little taller than recommended for St. Augustine grass, and much taller than recommended for Bermuda. If there is a good balance in the size of the flock to the size of the lawn, a flock of chickens can actually keep the lawn clipped, minimizing mowing. If there are too many chickens for the size of the lawn, the chickens will over-graze leaving bare spots and reducing the height of the turf below 2”, which can stress St. Augustine in the summer. Chickens can free-range a lawn, but if over-grazing is either a concern or your reality, consider using a moveable “chicken tractor” which can be relocated daily to control over-grazing in favored spots. A favored lawn care practice for natural gardeners is to top-dress the lawn with compost. Your chickens will love you for this. Hens love scratching in compost piles looking for treats. Top-dressing will not create a deep enough pile to offer them much scratching opportunity right away, but it will stimulate the earthworm population quickly, making the hens happy in the process. If you are feeling generous, give the girls a few shovels full in a spot just for them. They will quickly have it spread anyway. Backyard chickens will reduce your need for pesticides. In fact, you may never need to use a lawn pesticide after you establish your flock. Chickens are amazing bug-eaters. It’s also one of their more humorous activities – when one hen finds a bug, any other hen who sees her will rush to her in hopes of stealing it away should she drop it. The antics of chickens are part of the joy of raising a backyard flock. They can also reduce your need for herbicides, depending on the type of weeds you have and the chicken to lawn ratio. Many of the plants that we call weeds are plants that chickens love – chickweed, dandelions, wild strawberry, violets and clover. They make quick work of Poa annua, a common grassy weed species during cooler months. A large enough flock will hardly allow a weed to go to seed. It is safe to use corn gluten meal as a pre-emergent herbicide if it becomes necessary. Any other weed control should be carefully considered. Never use chemical herbicides where your flock will range. Pulling weeds by hand might seem to be a chore, but it is the most effective way if the problem is small. Used properly, vinegar can be effective if a patch of weeds must be treated, but the fastest way to deal with an unruly patch is to locate the chicken tractor right on top of the area and let the flock at them! Agricultural corn meal is an effective natural fungicide. If you can confirm that an issue is fungal, this product can be used in the lawn where your flock grazes. Once you have an established organic program, you will seldom find the need to use a fungicide on your lawn. Fuel spills or leaks should be avoided at all costs where chickens will graze. Place a sheet of cardboard or a pad of newspapers under your mower, string trimmer, edger, or chainsaw when filling with fuel and when adding or changing the oil.